The basic differences between these two breeds of cattle are what has prompted cattlemen to crossbreed them: matching the Angus and its higher-quality, more marbled meat with the Chianina and its higher-yielding carcass began in the United States in the late 1970s. This cross produces the high-protein, lower-fat content consumers want and provides cattlemen with an animal that more efficiently produces the meat he wants to market. The cross is called Chiangus. Both breeds are European, but originate from different countries. Angus cattle are Scottish; Chianina cattle are Italian. The Angus breed comes from Aberdeen and Angus counties in northern Scotland. 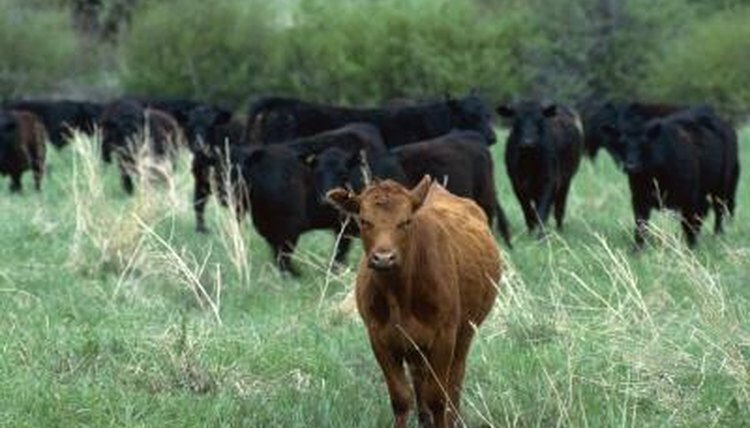 The production of meat has always been the purpose of raising Angus cattle. The Chianina breed is named for the Chiana Valley in central Italy where the breed was founded. Harnessing this breed's strength to aid humans in transportation was the initial use of the Chianina. Much of the modern Chianina stock can trace its lineage back to farms on the plains surrounding the Italian cities of Arezzo and Siena. Angus are called a British breed; Chianina are called a continental breed. Chianina cattle are significantly larger than Angus. Males and females weigh anywhere from 2,500 to 3,000 pounds. Their enormous size initially destined them for work as draft animals when humans domesticated the Chianina cattle, according to the North American International Livestock Exposition website. Angus bulls weigh approximately 2,000 pounds; the cows average just a bit more than half that at 1,150 pounds. Meat produced by an Angus carcass tends to be of a better quality meriting higher grading standards according to U.S. Department of Agriculture (USDA) meat-grading standards. Most Angus beef is graded Prime or Choice, according to the Cattle website. Meat from Chianina cattle infrequently receives a Choice grade simply due to its lower fat content, according to Virginia Cooperative Extension. The good news about a Chianina carcass is that pound for pound it yields more salable meat than an Angus. Angus and Chianina cows are both known for their ease in calving and strong maternal instincts in suckling and protecting young calves. These are traits appreciated by ranchers, who can allow the cattle to roam freely without a great deal of supervision. The biggest difference between these two breeds regarding their calving is the size of the calves: Chianina calves, with birth weights averaging between 80 and 90 pounds, are 10 to 15 pounds heavier than their Angus counterparts.